Over the past decade, Pew Research Center has documented the wide variety of ways in which Americans use social media to seek out information and interact with others. A majority of Americans now say they get news via social media, and half of the public has turned to these sites to learn about the 2016 presidential election. Americans are using social media in the context of work (whether to take a mental break on the job or to seek out employment), while also engaging in an ongoing effort to navigate the complex privacy issues that these sites bring to the forefront. In addition to measuring the broad impact and meaning of social media, since 2012 the Center has also tracked the specific sites and platforms that users turn to in the course of living their social lives online. In that context, a national survey of 1,520 adults conducted March 7-April 4, 2016, finds that Facebook continues to be America’s most popular social networking platform by a substantial margin: Nearly eight-in-ten online Americans1 (79%) now use Facebook, more than double the share that uses Twitter (24%), Pinterest (31%), Instagram (32%) or LinkedIn (29%). 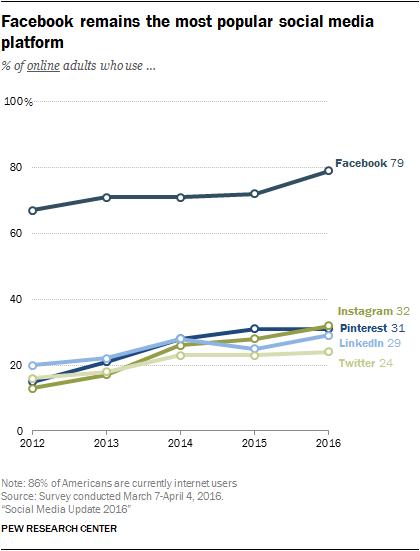 On a total population basis (accounting for Americans who do not use the internet at all), that means that 68% of all U.S. adults are Facebook users, while 28% use Instagram, 26% use Pinterest, 25% use LinkedIn and 21% use Twitter. What follows is a deeper examination of the current state of the social media landscape in America. Roughly eight-in-ten online Americans (79%) now use Facebook, a 7-percentage-point increase from a survey conducted at a similar point in 2015. Young adults continue to report using Facebook at high rates, but older adults are joining in increasing numbers. Some 62% of online adults ages 65 and older now use Facebook, a 14-point increase from the 48% who reported doing so in 2015. In addition, women continue to use Facebook at somewhat higher rates than men: 83% of female internet users and 75% of male internet users are Facebook adopters. Around one-third of online adults (32%) report using Instagram – roughly the same share as in 2015, when 27% of online adults did so. Roughly one-quarter of online adults (24%) use Twitter, a proportion that is statistically unchanged from a survey conducted in 2015 (23%). Younger Americans are more likely than older Americans to be on Twitter. Some 36% of online adults ages 18-29 are on the social network, more than triple the share among online adults ages 65 and older (just 10% of whom are Twitter users). Twitter is also somewhat more popular among the highly educated: 29% of internet users with college degrees use Twitter, compared with 20% of those with high school degrees or less. The share of online adults who use LinkedIn has remained steady over the past year: 29% report using the site, similar to the 25% who said this in 2015. Facebook remains the most popular social media platform, with its users visiting the site more regularly than users of other social media sites. Roughly three-quarters (76%) of Facebook users report that they visit the site daily (55% visit several times a day, and 22% visit about once per day). This represents a modest but statistically significant increase from the 70% of Facebook users who indicated that they visited the site daily in 2015. Other than this slight uptick among Facebook users, daily engagement for each of the other major social media platforms is generally similar to Pew Research Center findings from 2015. Instagram and Twitter occupy the middle tier of social media sites in terms of the share of users who log in daily. Roughly half (51%) of Instagram users access the platform on a daily basis, with 35% saying they do so several times a day. And 42% of Twitter users indicate that they are daily visitors, with 23% saying they visit more than once a day. 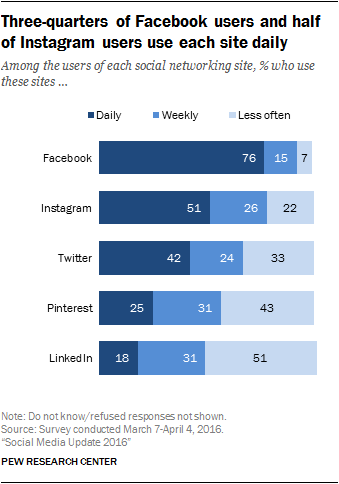 A slightly larger share of Americans use Pinterest and LinkedIn than use Twitter, but users of these sites are less likely than Twitter users to check in every day: 25% of Pinterest users and 18% of LinkedIn users are daily visitors. Social media users continue to use a relatively diverse array of platforms. More than half of online adults (56%) use more than one of the five social media platforms measured in this survey, a share that is statistically unchanged from the 52% who did so in 2014. As the most-used social media site, Facebook continues to be the starting platform for most social media users. Among those who only use one social media platform, 88% indicate that Facebook is the one site that they use. Moreover, the vast majority of those who use other social media sites also use Facebook. For instance, 93% of Twitter users also use Facebook – as do 95% of Instagram users and 92% of Pinterest users. 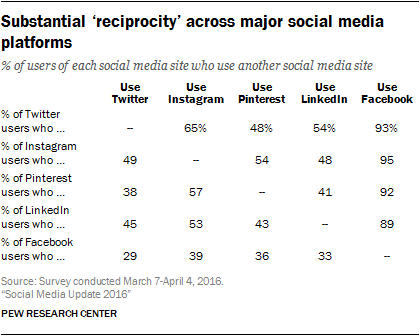 Outside of Facebook, other sites’ users show high levels of reciprocity. For instance, 65% of those with a Twitter account also use Instagram, while 49% of Instagram users also have Twitter. Similarly, 54% of those who use Instagram also use Pinterest and 57% of Pinterest users are also on Instagram. Social media sites are not the only venue where people can connect with others online. Today smartphone owners (at the time of this survey, 72% of American adults) can choose from a variety of messaging apps that fill many of the same functions. Some of these apps look and function like a traditional chat or messaging service, while others offer unique features – such as the ability to post anonymously, or to have one’s posts expire or delete themselves after they are viewed. 24% use messaging apps that automatically delete sent messages, such as Snapchat or Wickr. This represents a 7-point increase from a survey conducted in 2015 (at that point 17% of smartphone owners used these apps). 5% use apps that allow people to anonymously chat or post comments, such as YikYak or Whisper. This is the first time Pew Research Center has asked about these types of apps. 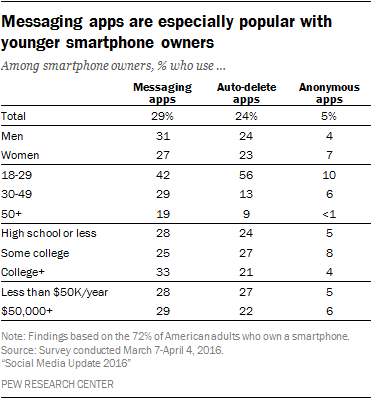 In general, messaging apps are especially popular among younger smartphone owners. Some 56% of smartphone owners ages 18 to 29 use auto-delete apps, more than four times the share among those 30-49 (13%) and six times the share among those 50 or older (9%). Similarly, 42% of smartphone owners ages 18 to 29 use more general messaging apps like WhatsApp or Kik, compared with 19% of smartphone owners ages 50 or older.